This match was played on Tuesday night after the weekend game was cancelled due to rain. Conditions were fine and the ground surface was good, a testimony to the University ground after being unplayable only three days earlier. This was always going to be a difficult game for the Two Blues who were affected right across the field by injury, suspension and withdrawals due to the midweek timing. As always, those who were called up performed with a maximum of effort and did not shirk the confrontations. A lone figure wearing a Russian fur hat as observed lurking in the grandstand before and during the game, occasionally loudly providing helpful advice to players, coaches and the referees alike, with a slight Russian accent. Could this enigmatic figure have been our own Thommo returned from frostier locations? 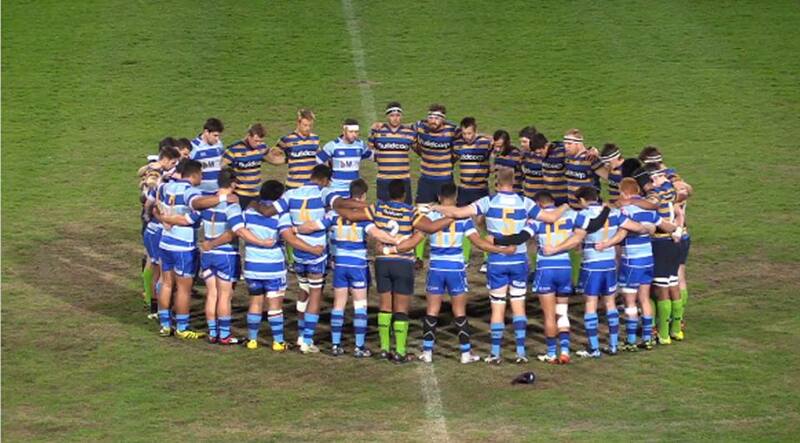 Uni kicked off to the southern end and Parramatta were immediately under pressure due to a knock on. It took only four minutes for Uni to score a try from a slick backline movement, taking the score to 7-0 after the conversion. The next 18 minutes saw no change to the score, with Parramatta steadying and putting together a good sequence of phases. In this period there was good work by the forwards, John Poe and Robert Duff. A potential Uni try under the posts was thwarted by good work from Adrian Musico and Andrew Cox to prevent the ball being grounded. The resultant scrum restart, however provided Uni with a penalty try in the 25th minute after three scrum penalties to Uni. Brendan Crosilla was blamed for these indiscretions and was yellow carded. These decisions were considered to be debateable in some sections of the assembled spectators, especially due to the scrum appearing to be unstable before the ball was fed. While Parramatta were a man down Uni scored a pushover try in the 31st minute and in the 34th minute after a slashing midfield break. Parramatta pressure from the forwards just before the half time break, led to Andrew Cox crashing over in the right hand corner. The half time score was Uni 28 – Parramatta 5. It is not surprising that Parramatta went well in the periods of the half when they controlled possession and were able to mount some pressure on Uni. Conversely, Uni seemed to score at will in periods when Parramatta were unable to string together more than one or two phases. Performances worthy of mention included those of Andrew Cox, Robert Duff playing in the centres, Waldo Wessels, John Poe, Brendan Crosilla with the ball and Jaline Graham. Early in the second half a line out on the Uni 35m saw Waldo Wessels take the ball and cut through the Uni forwards and outpace the cover, leaving the Uni defence to say………wait for it……….wait for it….. “Where’s Wally?” This brilliant individual try and conversion from near touch by Jaline Graham saw the score go to Uni 28 Parramatta 12 in the fourth minute. For the next 25 minutes or so, there was no score as Parramatta camped in the Uni half. Uni had a player yellow carded in the 16th minute which assisted the cause, as did several turnovers forced by Andrew Cox. Unfortunately just as Parramatta started to mount some tryline pressure, it was let off by Parramatta turnovers. In the last 10 minutes of the game Uni found their way into the Parramatta quarter aided by poor possession control from Parramatta. In the 35th minute Uni scored under the posts from a scrum on the Parramatta line. This was converted to take the score to Uni 35 Parramatta 12. In the 38th minute a poor pass from Andrew Cox and a misunderstanding with its intended recipient saw Uni swoop to pinch another converted try. The final score Uni 42 Parramatta 12. As always there was not one Parramatta player who did not give 100 percent effort. Late replacements in critical positions did not help the cause, but in the end it came down to the old footballing adage – If you don’t keep the ball, you can’t score. A special mention to Robert Duff who had an excellent game away from his normal wing position. A week off to recover from niggling injuries and a home game at home against Gordon will surely see a change in Parramatta’s fortunes. It is likely that this report will be again penned by Comrade Thompson so it is adieu to The Apprentice and the Thommo Phantom for a while.